Büyük adamlara en yüksek rütbeyi ve en parlak şerefi devlet değil, millet verir. Which, as I understand it, is an interesting look at the traditional Turkish regard for what constitutes a devlet as opposed to what constitutes a millet, and which is preferable. The highest distinction and most shining honor for great men is not to bequeath a state, but a nation. Amidst the news of the decreasing use of tear gas (which I cannot independently confirm) and the (more certain) news of the use of capsaicin in TOMA trucks’ water cannons (instead? 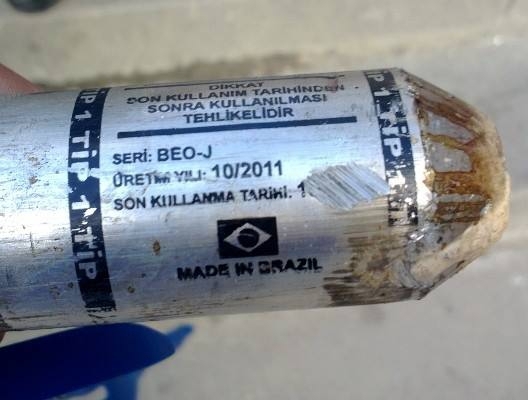 ), here’s a familiar image of a tear gas canister with its expiration date conveniently elided. 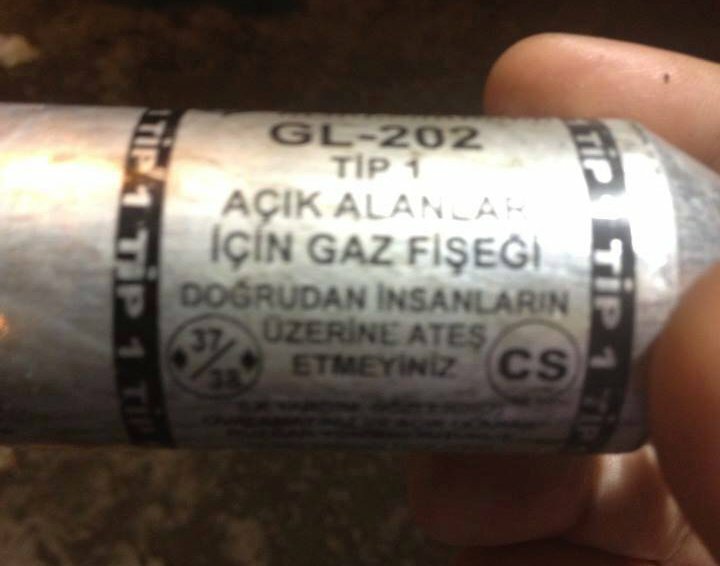 How “open” those areas and how “directly” the canisters are fired are, presumably, the prerogative of the end user. In an effort to escape the myopic mumblings of the Middle East’s self-proclaimed pundits this past week, I picked a copy of George Friedman’s The Next Decade (2012) out from between the Harlequin novels of a small-town bookstore and, retreating to a lawn chair for the afternoon, paged through his familiar prose. His sober, measured, and readable approach to the next ten years of global politics is written primarily in terms of geopolitical imperatives, and from the viewpoint of the American presidency. Shunning realist-idealist distinctions, he sets out on a nuanced vision of the near trajectory of world politics as divined by history and geography. That I find it difficult to argue with his augury is reassuring, his conclusions being very similar to my own, and generally much more well-informed. When it comes to the Middle East, specifically, Friedman plainly sketches the necessity for a new, post–Iraq-war (2003–2011) balance of power. At present, he suggests, the imperative is an accommodation with an expansionist Iran, allowing Turkey the time to develop into the regional bulwark that will eventually compete with Iran and re-stabilize the region. [The United States and Iran] despise each other. Neither can easily destroy the other, and, truth be told, they have some interests in common. In simple terms, the American president, in order to achieve his strategic goals, must seek accommodation with Iran. This seemingly impossible strategic situation driving the United States to this gesture is, as we’ve discussed, the need to maintain the flow of oil through the Strait of Hormuz, and to achieve this at a time when the country must reduce the forces devoted to this part of the world. Aspects of Iran’s influence would range from financial participation in regional projects to significant influence over OPEC quotas to a degree of influence in the internal policies of the Arabian countries. Merely by showing a modicum of restraint, Iranians could gain unquestioned preeminence, and economic advantage, while seeing their oil find its way to the market. They could also see substantial investment begin to flow into their economy once more. The U.S. does not see a war on the horizon. Nor does it see a fallen Iranian regime. If anything, it sees an assertive, opportunist Iran edging out some of the GCC’s petroleum market share and gumming up the works in the Arabian peninsula. If nothing else, it sees this as a very real possibility. With Iranian influence potentially dominant in the new Iraq and the old Syria, the U.S. is in need of a hedge against a new Iran and a new oil empire. This “hedge” was the attempt to guarantee that Iran continued to denominate its oil sales in dollars through the brutal sanctions begun by President Obama on December 31st, 2011. The intention was to annihilate the rial, leaving the uniquely stable dollar as the only sensible alternative. In effect, this is the American precondition to Iranian expansion: (a) Exercise “a modicum of restraint,” and (b) whatever you do, do it in dollars. Whether Iran—once determined to disregard the dollar entirely—has accepted this precondition is still a matter of confusion. But don’t expect Ahmadinejad, or the next Iranian president, to scream it from the rooftops if Friedman is right. The Iranians will be assuaged in the short run by their entente with the Americans, but they will be fully aware that this is an alliance of convenience, not a long-term friendship. It is the Turks who are open to a longer-term alignment with the United States, and Turkey can be valuable to the United States in other places, particularly the Balkans and the Caucasus, where it serves as a block to Russian aspirations. As long as the United States maintains the basic terms of its agreement with Iran, Iran will represent a threat to Turkey. Whatever the inclination of the Turks, they will have to protect themselves, and to do that, they must work to undermine Iranian power in the Arabian Peninsula and the Arab countries to the north of the peninsula—Iraq, Syria, and Lebanon. In the long run, Turkey cannot be contained by Iran. Turkey is by far the more dynamic country economically, and therefore it can support a more sophisticated military. More important, whereas Iran has geographically limited regional options, Turkey reaches into the Caucasus, the Balkans, Central Asia, and ultimately the Mediterranean and North Africa, which provides opportunities and allies denied the Iranians. . . . Over the next decade we will see the beginning of Turkey’s rise to dominance in the region. It is interesting to note that while we can’t think of the century without Turkey playing an extremely important role, this decade will be one of preparation. Turkey will have to come to terms with its domestic conflicts and grow its economy. The cautious foreign policy Turkey has followed recently will continue. It is not going to plunge into conflicts and therefore will influence but not define the region. The United States must take a long-term view of Turkey and avoid pressure that could undermine its development. In due course, the Turks will begin to react by challenging the Iranians, and thus the central balance of power will be resurrected, stabilizing the region. This will create a new regional balance of power. Voila! Even the doubters have to appreciate the beautiful simplicity of reading the regional state of affairs—Syria, most visibly—through this lens. (1) Accommodate and contain Iran while (2) Turkey develops into its natural counterbalance. Certainly, Turkey and Iran have already been at odds over their regional interests. One wonders if it can be so simple. But perhaps the more interesting question is: Does Erdoğan read Friedman? How about Ahmadinejad? Obama? The last few days’ demonstrations in Turkey can be likened to a heavy binge. Whatever brought everyone to the table in the first place is quickly, and readily, forgotten in the pleasant haze of mutual drunkenness. Like any binge, though, the catharsis only lasts until morning, or whenever the tap runs dry. It will be only then—wondering at their cuts and bruises—that the participants will remember what drove them to drink in the first place. Until then, the grandiose, incomprehensible mumblings and gestures of the participants can only be understood in terms of what they’ve had to drink, and how drunk they’ve become. Some are drunk on high ideals, some are drunk on power, and many are drunk on passionate indignation. The one thing that draws everyone together, though, is that right now they’re all, quite literally, stumbling in the street. But once the broken glass, blood, tears, and dried lemon wedges are swept up in the morning, someone will start asking the crucial question: Did we just have a bad week, or is this going to become a regular thing? Certainly, Turkey had a bad week: Two instances of largely unwelcome government morality-policing were widely publicized and protested. First, a reprimand for kissing couples on the Ankara Metro, and second, the parliament’s approval of an anti-alcohol bill (shops, 10pm-6am). But public sentiment really united on two further incidents. First, the sit-in at Gezi Park, and second, the police’s disproportionate response to that sit-in. With an opportunity for a good, justified binge, everyone came out: The communists are waving their flags. The alcoholics are throwing their empties. The anarchists are wearing their black, made-in-China tees. The football fans are organizing themselves by team affiliations. The journalists are setting their exposures and snapping pictures worth a thousand dishonest, one-sided words. And the police, whether concerned about their public image or simply their own safety, provoke the assembled with undercover officers and disperse the crowds with their only weapons—tear gas, water cannons, rubber bullets, and batons. But while protesters and news organizations peddle the big words that sell—revolution, unity, discontent, fascism, etc.—we, the observers, need to try to maintain our own sobriety in the face of a national binge and the bartenders who profit. The “anarchist” youth who burned the truck in Kızılay, Ankara are certainly less suitable for parliament than “Tayyip.” And however similar the “righteous” opposition seems today, their unity is forged in one night of tears shed together—a relationship that dissipates as quickly as the clouds of OC gas that brought it on. Whether Erdoğan and the AKP is still, in the eyes of the majority of Turks, fit to operate the country in their alleged power-drunken state will be seen in the next general election. Rest assured, though, that whatever the conclusion, the cuts and bruises from the last few days will not quickly be forgotten.